Sentinel 3-A SLSTR thermal bands allow us to have an excerpt on the phenomenon of thermal inertia and heat transfer involving the land masses and oceans on our Planet. The thermal inertia is the propensity of heat to transfer between two different materials or bodies. Indeed each material has a different specific heat capacity (namely the energy that must be transferred to a material or substance for one gram to have a one degree rise in temperature) and so a different attitude in heat transfer. This explains the behaviour of heat to transfer more slowly to some bodies than others. The water has an high heat capacity and this is why oceans, seas and other water surroundings take longer to increase/decrease its own temperature compared to the land masses. The water temperature remains relatively the same from day to night, whereas the land has a big temperature range. 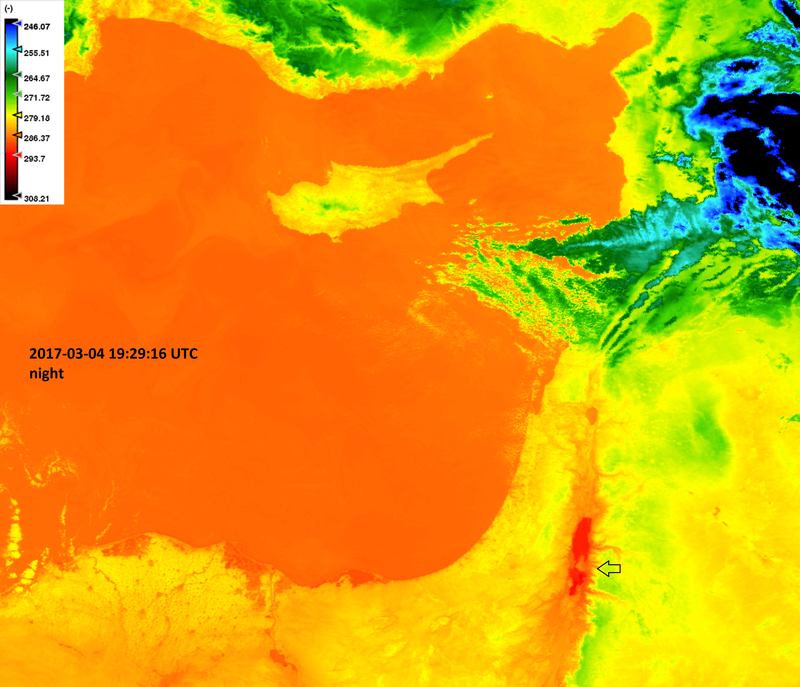 The following SLSTR thermal images have been captured on Mediterranean Sea/Middle East. They are composed by two pairs of two time-consecutive products. The first pair of product has been acquired during the daylight, the second one during the night and so without direct Sun irradiation. N.B. The two footprint images composing the gif have different inclination because the daylight acquisition are performed in the descending phase of the orbital dynamic (north to south) whereas the night images are acquired in the ascending phase (south to north). We can see different and variegate temperature profiles all over the continental zone, from Turkey internal zone, through Middle East up to around 30°C of Red Sea coastlines. Moreover there are four different seas captured in those images: the Black Sea (few degrees of temperature), Mediterranean Sea (around 20°C) and the warmer Dead Sea and Red Sea. They are cooler than the adjacent land borders and all of them have completely different temperature patterns. 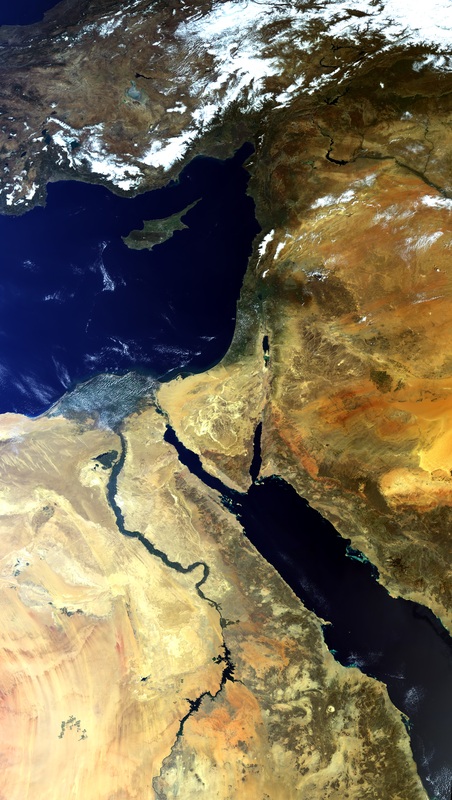 The same evidence is standing for the Nile, where the river path is clearly recognizable for its different temperature profile compared to the land surroundings. The evidence of the thermal inertia and the heat capacity difference of waters basins with the land masses is clear switching to the night image: the temperature profiles are quite different compared to the images acquired in the daylight. All over the continental part the temperature is decreased of around 10°C, whereas the sea’s temperatures are almost the same observed during the day. Thereafter the seas appear more warmer than the adjacent lands , opposite behaviour of the daytime. Because of this phenomenon the coast cities need more time to heat up/cool down than the cities in the hinterland, therefore they have a less extreme temperature range and a such different pattern compared to inland cities. The different thermal excursion between land and water is more evident regarding enclosed water basins such as lake or, in our case, the Dead Sea. Here below the SLSTR acquisition zoomed to show details on the salt lake. 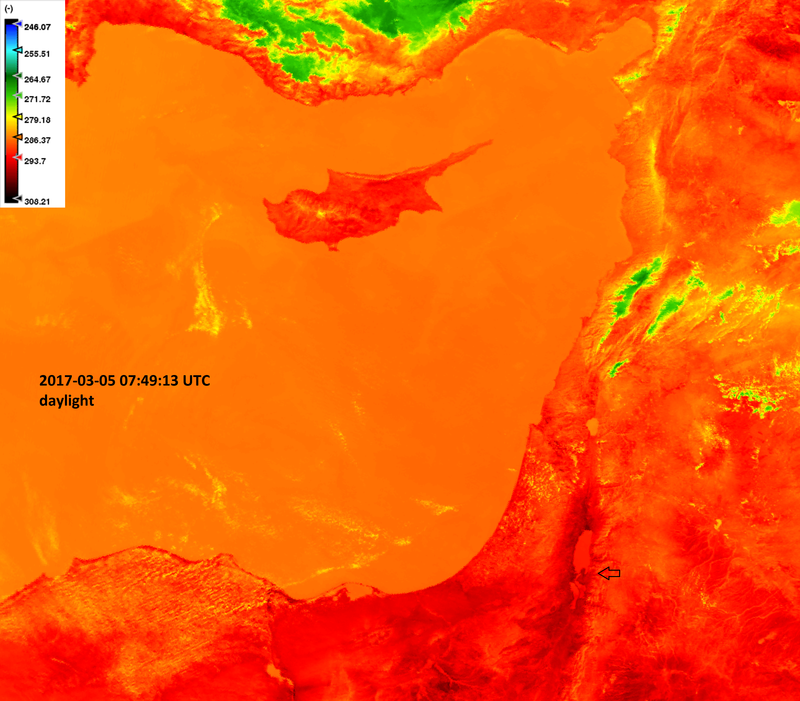 The Dead Sea is much warmer than its adjacent land borders during the night (image above), with its around 20° C degrees of temperature (the legend is expressed in Kelvin), whereas the coast are cooler and the temperature has a downward trend up to the inner zone. On the opposite the daylight image (below) shows a complete different trend: the land zones are warmer than the Dead and Mediterranean Sea, e.g. Cyprus, the Egyptian coast and all the Dead Sea surroundings. Moreover a small mitigation of the water temperature is observed compared to the night image (red and orange colours are attenuated). All the SLSTR images have been generated with the 12µm band response. The entire daylight scene has been also captured by the OLCI instrument: the following RGB image with natural colours is almost cloud free and it shows clearly a big part of the Nile river path as well as Cyprus, the Dead Sea and other points of interest, e.g. the Eufrate river and the Al Assad lake in the northern part of Syria.